HAUS Salon partnered with The American Refugee Committee (ARC) in the Nu Po Refugee Camp in Thailand. Gender-based domestic violence is a worldwide issue and as hairdressers we create a safe place for people to open up about their experiences with it. The ARC serves to train hairdressers living and working in the Nu Po camp to spot signs of domestic violence and to offer victims the resources they need to get help. HAUS Salon, clients, family and friends raised a $27,000 cash contribution for the program, while HAUS co-founder Charlie Brackney Love led a team of 5 HAUS stylists who volunteered to travel to Thailand to help give these hairstylists new business skills and haircutting techniques to set this program up for success. Stylist Director Natalie Hansen, Color Director Nikki Brown, Stylist Carrie Reilly and Color Apprentice Mackenzie Torsch joined Charlie and Brent Love from the ARC in Thailand in April 2016 for this 4-day workshop in Nu Po. Read all about their adventures on this page below. Our trip to Nu Po refugee camp in Thailand was nothing short of life-changing for our team and for the hairdressers we had the privilege of educating. We had the honor of learning about this incredible part of the world and teaching what we know to talented and eager hairdressers across the world. These hairdressers learned modern haircutting, styling and hair coloring techniques, tips for shampooing and stress relieving treatments as well as valuable skills from our Minneapolis stylists. The workshop may only have be 4 days long, but a lifetime of learning for everyone involved happened in that short time. The American Refugee Committee's SGBV Committee meets with the HAUS team. This committee is the group that will receive the generous donations from HAUS clients, friends and family to continue their valuable work. The HAUS team also met Salimyint who comes from a family of weavers. The ARC helps support him with a loom and a yarn bank where he can get a loan of yarn that he pays off over time. His income from weaving is a huge support to his family. His skill is evident in the beautiful cloth he makes...over 20 yards per day! On Monday, the HAUS team goes to Nu Po to start their salon education with the refugee hairdressers there. The HAUS team arrived safely in Thailand. They spent the weekend settling in, resting and were even able to sneak in a little sightseeing in Bangkok before their big 4-day salon training workshop they'll host at the Nu Po Refugee Camp. A toast for all of us back home from Brent, Charlie, Mackenzie, Nikki, Natalie and Reilly. Nikki celebrated her birthday in Thailand. Cheers! And they're off! The HAUS team plus Brent from the ARC left Minneapolis for Thailand early this morning and took a pre-flight selfie to commemorate the moment. This is the team that will be educating hairdressers in the Nu Po Refugee Camp in Thailand. Good luck and safe travels! The team of HAUS stylists traveling to the Nu Po Refugee Camp in Thailand are making final preparations this week for their trip. In addition to squeezing in those last few client services and packing everything they'll need personally, they also must pack all materials they'll need to teach the hairdressers in the camp. HAUS would like to extend a HUGE THANK YOU to fellow stylists in the Twin Cities who generously donated tools for the hairdressers in Thailand to use in their salons. Things like hair dryers, irons, clips, combs, shears and much, much more. Thank you to Urban Village Salon in St. Paul, Petite Salon in St. Paul, The Apiary Salon in St. Paul, The Beauty Room in Minneapolis, Salon Moda in Vadnais Heights, Spalon Montage in Chanhassen, and many more. Minneapolis stylists working together to help stylists across the world - we love it! Here is the education team from HAUS Salon who has volunteered to take the trip to Thailand. HOW DID HAUS SALON RAISE $27,000+ FOR THE AMERICAN REFUGEE COMMITTEE? When we first set a fundraising goal of $25,000 last Fall, it seemed unattainable, but a good challenge. Thanks to donations from generous clients, friends and family, we were able to reach and exceed that goal and continue to raise money for the American Refugee Committee and their program to stop gender-based domestic violence. The money raised by HAUS Salon is enough to fund the SGBV program for a full year. Below are two events that also helped us reach our fundraising goal. Many thanks to everyone who helped us donate to this cause so close to our hearts. Visit our Go Fund Me page to donate to the cause. 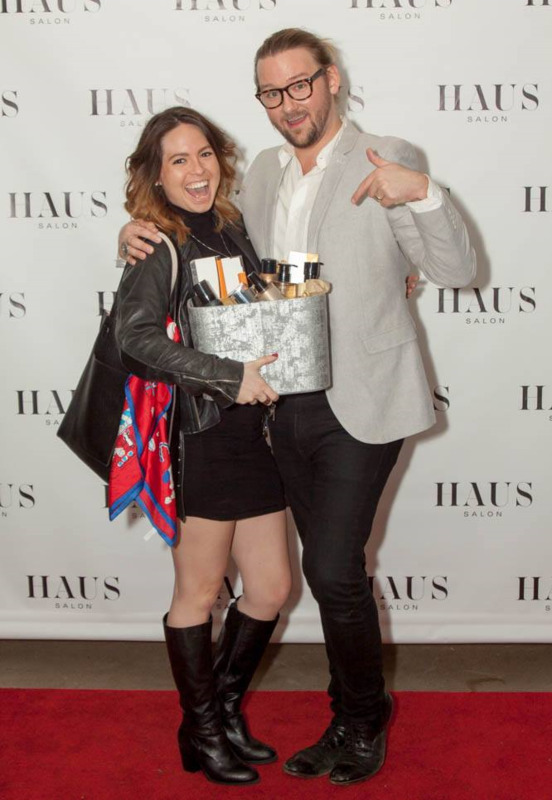 A team from HAUS Salon (and some favorite clients) spent their Valentine’s Day enjoying salon services at our Salon-a-Thon fundraiser at HAUS Salon North Loop. The event which featured haircuts, color, waxing services, facials, massage, manicures and pedicures from some of our HAUS Salon favorites, was a huge success. We raised nearly $8,000 for the American Refugee Committee! We are humbled and grateful for the support. Generous guests flocked to our North Loop salon before the holidays to help HAUS Salon raise money for Thailand. An incredible silent auction filled with art, fashion, fitness, salon services and more with items donated by generous friends and neighboring businesses of HAUS, along with a Wine Toss, Raffle Prizes, and even services from Fortune Tellers raised more than $6,000! It was an evening of fashionable fun in the North Loop, all to benefit a great cause.